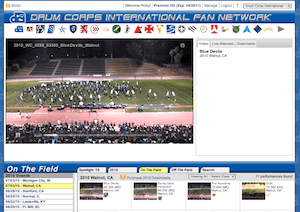 Video On Demand from the July 3 Drum Corps International Tour Events in Walnut, CA & Michigan City, IN., is now available for playback on the DCI Fan Network. You can watch the performances of The Cadets, The Cavaliers, Glassmen, Madison Scouts, Colts, Teal Sound, Colt Cadets, Legends, Blue Saints, Blue Devils, Santa Clara Vanguard, The Academy, Pacific Crest, Mandarins, Gold, Impulse, Revolution, Velvet Knights, City Sound, and So. Cal Dream in their entirety, at the click of a mouse button.